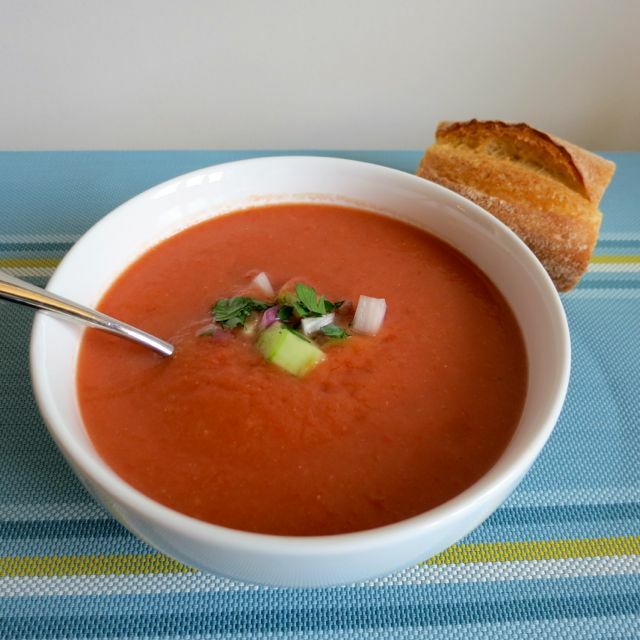 Summertime is here and what better way to celebrate than with a fresh bowl of gazpacho and some crusty French bread. Williams Sonoma always has such beautiful pictures of food so I decided to try the gazpacho recipe printed in one of their catalogs to see how it turned out. And it turned out great! This tomato-based gazpacho combines the flavors of heirloom tomatoes, parsley, and fresh lemon juice to produce a deliciously satisfying gazpacho. 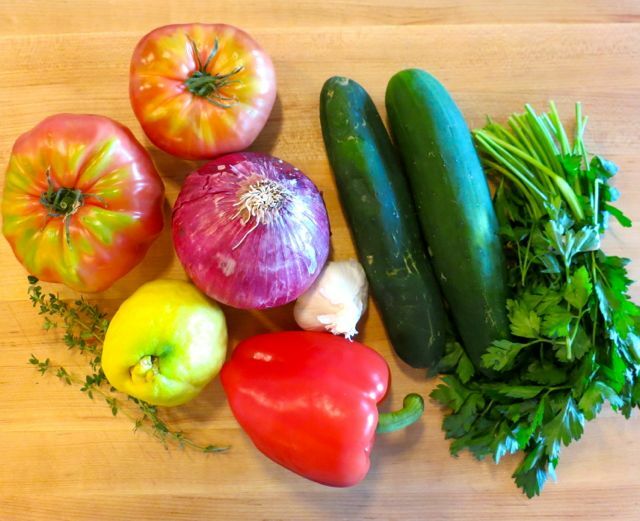 In a small bowl, stir together 1/2 cup onion, 1 cup tomatoes, 3/4 cup cucumbers, 1 tsp. lemon juice, 1 Tbsp. oil, parsley, and 1/2 tsp. salt and pepper, to taste. Refrigerate until ready to serve. In a Vitamix blender, combine remaining onion, 4 tsp. lemon juice, 1 Tbsp. salt, garlic, thyme, vinegar, and bread. Turn blender on, slowly increase speed to highest setting and blend until smooth. Add half of remaining tomatoes, cucumbers, and bell pepper; blend until completely smooth, about 1 minute. Blend remaining tomatoes, cucumbers, and bell pepper until smooth. Season with pepper. Transfer to a bowl and refrigerate for at least 1 hour or up to 1 day. Just before serving, transfer soup to blender. With blender on lowest setting, slowly stream in 3 Tbsp. oil (I only added 1); blend 1 minute. Ladle gazpacho into bowls. Garnish with heaping spoonful of diced vegetables. thanks Angela, I am sooooo going to make this! :) I will probably garnish with a few sprigs of arugula.